From 2011 to 2012, Dawn swept over Vesta, capturing images that exceeded everyone’s imaginings— craters, canyons and even mountains. Then on Ceres in 2015, Dawn showed us a cryovolcano and mysterious bright spots, which scientists later found might be salt deposits produced by the exposure of briny liquid from Ceres’ interior. Through Dawn’s eyes, these bright spots were especially stunning, glowing like diamonds scattered across the dwarf planet’s surface. 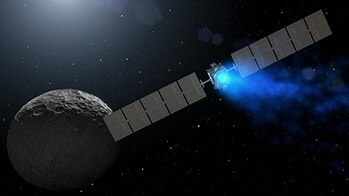 Dawn is the only spacecraft to orbit a body in the asteroid belt. And it is the only spacecraft to orbit two extraterrestrial destinations. These feats were possible thanks to ion propulsion, a tremendously efficient propulsion system familiar to science-fiction fans and space enthusiasts. All the while, scientists gained new insight into the early stages of our Solar System, fulfilling Dawn’s objective. The mission was named for its purpose: to learn more about the dawn of the Solar System. It targeted Ceres and Vesta because they function as time capsules, intact survivors of the earliest part of our history.